Easily adjusts up & down to your chosen height. 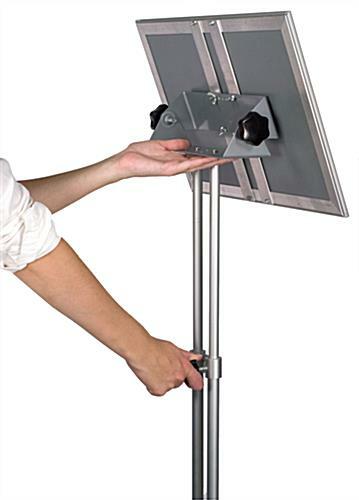 Frame tilts to a desired viewing angle. Can be placed in vertical or landscape position. Snap-open edges for easy sign changes. 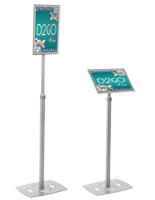 This lobby stand, also known as a sign holder, offers maximum flexibility and versatility. 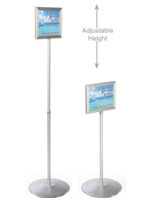 This poster display features height and tilt adjustability. 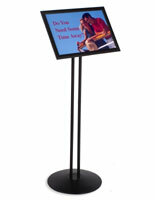 Designed to hold 11" x 17" signs and menus, this lobby stand is great for a wide variety of locations. 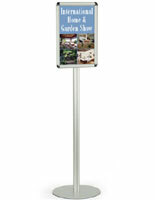 Position this sign pedestal in a busy entranceway or vestibule to greet visitors. 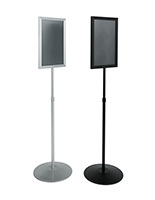 Each lobby stand features a double metal pole stand, matching base, and a snap open sign frame. 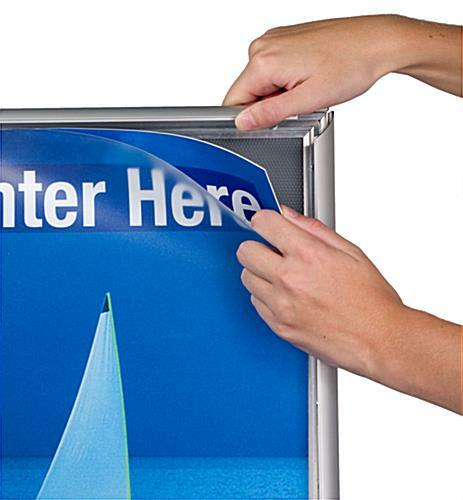 A silver brushed aluminum finish adds style to your display, while flip open edges allow for fast graphic changes. We provide this lobby stand with an acrylic lens to protect your signs and reduce glare. Sign change outs are easy with the snap frame design. This lobby stand is a versatile sign holder that allows you to customize the look of your display in many ways. 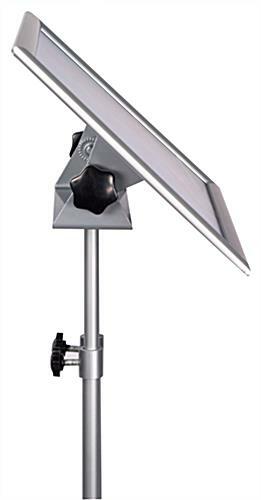 The weighted base keeps the unit upright, and prevents tipping from incidental contact. 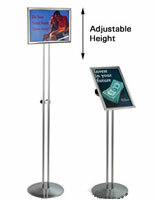 Each directory display, lobby stand features an adjustable height that can move up and down in a wide range of settings. The metal posts can also hold the sign frame in the vertical or horizontal position. 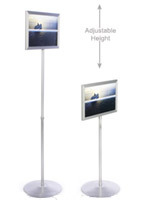 The lobby stand frame tilts a full 180 degrees and can be placed to any desired viewing angle. Raise the height and place the frame straight on to use as a poster stand. Or, drop the height and tilt the frame back to use as a directory or menu display. 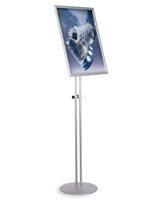 Whichever way you decide to use it, this lobby stand will look great in any indoor location. I was looking for a highly durable stand that we could use for a variety of events in our building. Despite the two base poles, these are not as solid as I expected but I don't expect them to tip over or be easily knocked over. It's not as easy to switch between the horizontal and vertical display as I'd hoped, but it's no deal breaker. Overall, good purchase especially for the price. We ordered 5 stands. They are exactly what we needed and work perfectly. However, the top of all 5 of the stands were bent and would not fit correctly or adjust. Rather than go through sending them back, we hammered them back into shape. Quite an effort, but they now work. It seems the boxes were handled roughly and thrown around. Hi Brenda! We're glad the stands worked out in the end, but we apologize for the product arriving bent. One of our customer care specialists will be reaching out to you to discuss this further. Thank you! Everything looks great with the sign except the frame was bent and we had to bend it back to normal. I'm assuming it was bent during delivery, but I am planning on purchasing at least 12 more of these signs and want to make sure we are not going to have to bend each one back to normal. Hi Jill, We are sorry to hear the frame was bent. We will have a customer care representative reach out to you.